Access is via 2nd House Rd, across the railroad tracks to Navy Rd. which runs along Fort Pond Bay. This is the original area where Montauk was formed and it has a rich history. I have divided it up in to two parts If you park your car along Navy Rd (watch out for parking signs), you can either walk west to Rocky point or east to Culloden Point (and on to the inlet to Lake Montauk), see next entry. Navy Rd is so named because there was a US submarine base here during 2nd World War where they tested torpedos! It is about 1 mile to Rocky Point. And, yes, the beach is rocky! After about 0.5 miles you will reach a long fishing pier, with an adjacent parking lot, a field with picnic tables and bathrooms. You can reach this spot by car at the east end of Navy Rd. It’s called Edward Vincent Ecker, Sr.,Memorial Park and Fishing Pier. The late Eddie Ecker Sr., was East Hampton Town supervisor, a 55-year member of the Montauk Fire Department, and a charter member of the Montauk Ambulance Company. You may have spotted a bumper sticker saying “I know Eddie Ecker”. Yes, it’s the same guy! Initially, this was meant to protect drivers against local police handing out tickets for illegal parking or speeding. Then it spread and became a fad across many parts of the country. 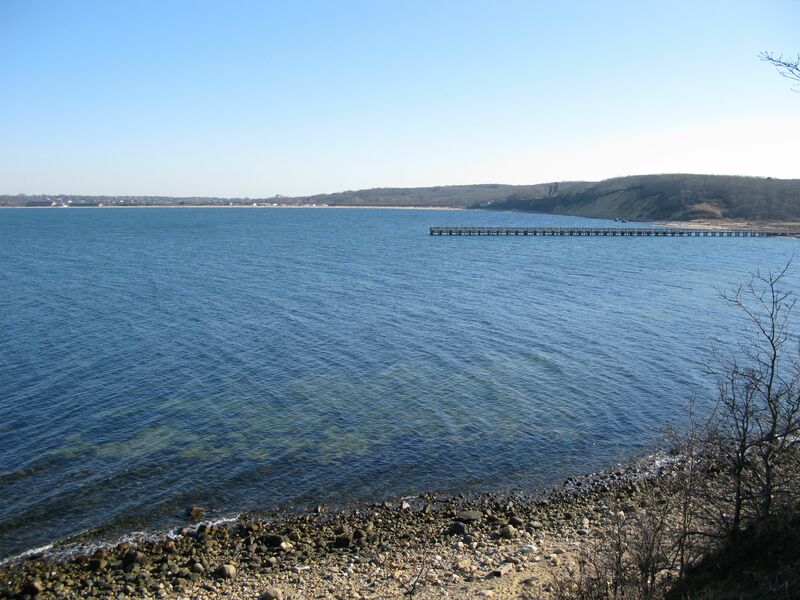 The area marks the east end of Hither Woods and you can walk along well maintained trails, part of the Paumanok path, on the bluffs above the beach, from where there are stunning views of Fort Pond Bay. 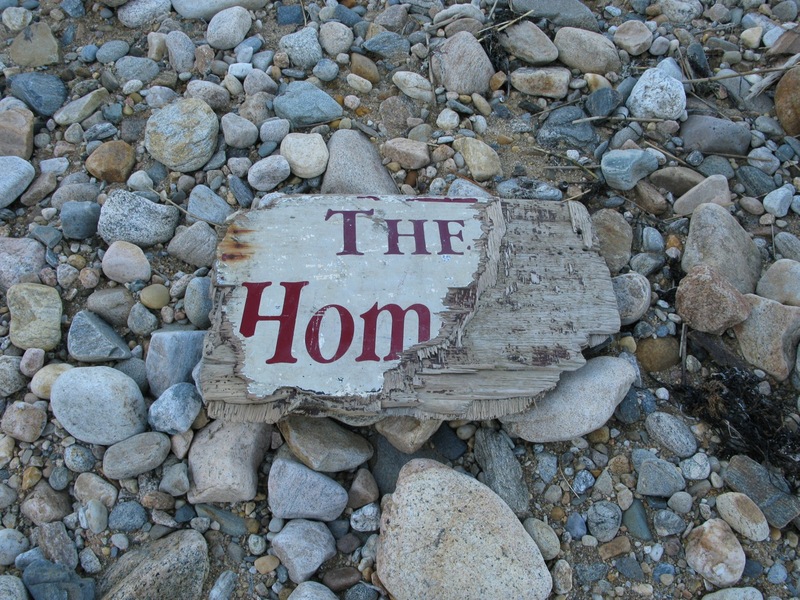 In the area of Rocky Point there are several ruins of fisherman homes built close to the bluffs, and one which toppled over the steep sandy cliff. The beach itself along most of this walk is not easy going because of large stones and boulders. You can find some interesting stones, a lot of drift wood and quite a bit of garbage including an old bicycle! You can get to Culloden point either from the west (Navy Rd) or from the east leaving your car at Gosman’s Dock. It is a long way to Culloden Point (about 3 miles). On our latest visit it was cold and windy and progress was difficult because the beach was stony and rocky. We were exhausted after the 6 mile round trip. We left the car on Navy Road west of the piers associated with various private condos, restaurants and nightclubs. There are plenty of “no trespassing” signs, but if you hug the shore you wont be bothered specially off season. This area is used for scuba diving lessons in the summer. Around the piers you can find all sorts of military artifacts, because this used to be a U.S. Navy Submarine Base where torpedos were tested during 2nd WW. Currently, the Navy Road night clubs are considered a nuissance by local residents because of the noise in the summer. Continuing east past the piers you come across the Duryea family business: a lobster deck and seafood market. You will have to walk behind their building to continue along the beach. It gets pretty rugged from this point on. You can catch a glimpse of interesting private homes on the bluffs 50 feet above the beach. Eventually, one reaches a very nice cove with sand, quite romantic and seemingly far away from the crazy “hamptons scene”. One more corner, and you will see in the distance the piers marking the entrance to Lake Montauk, with Gosman’s Restaurant and all the large commercial fishing boat marina. This is Culloden point. 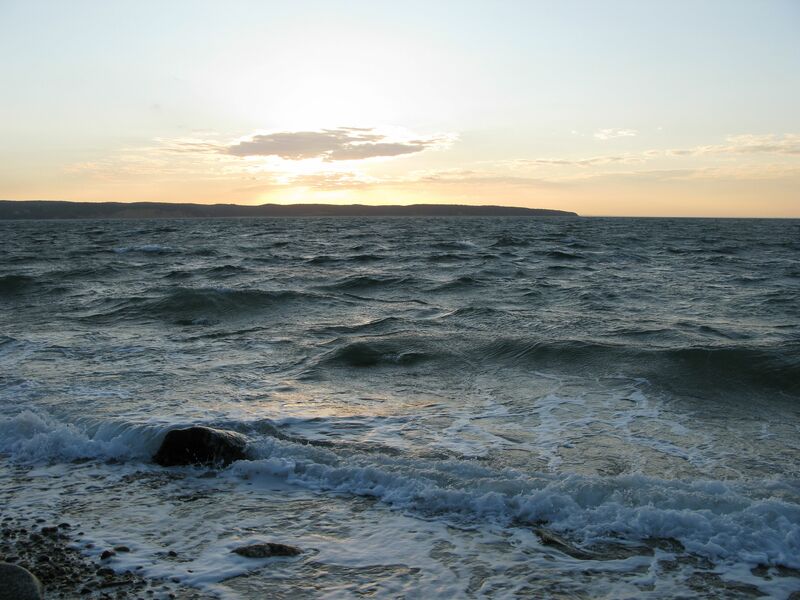 Culloden point is named after the ship wreck of HMS Culloden in 1781, a British war ship that was trying to intercept French warships that were attempting to run the blockade at Newport RI! The cannon retrieved from the Culloden is on display at the East Hampton Marine Museum in Amagansett on Bluff Road. 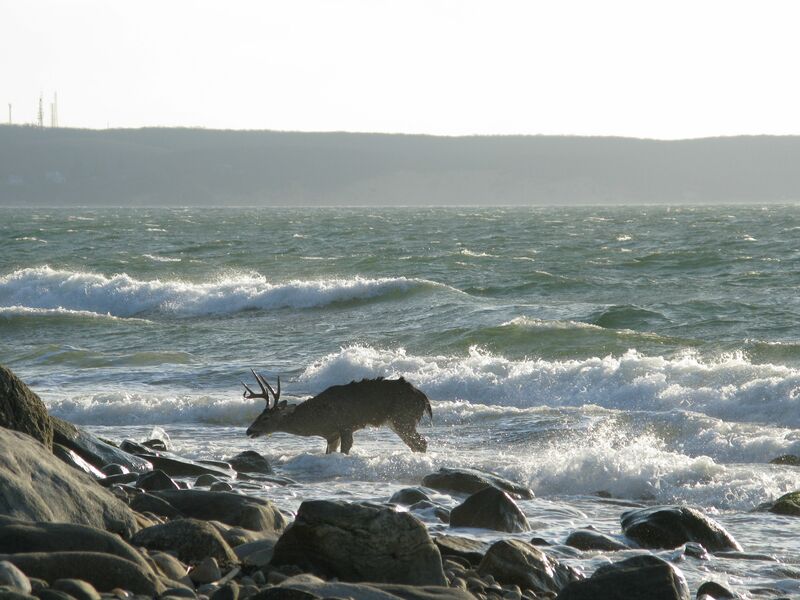 and a beautiful live buck with big antlers standing in the rough waters about 30 feet off shore near Culloden point. He might have been taking refuge from hunters beyond the bluffs, or from our German shepherd (who was very interested). When we returned 20 minutes later he was gone. Otherwise the beach was unremarkable with few shells, little intact sea glass, but quite a bit of drift wood and garbage including the entire front axel of a truck, half submerged in the sand. As you might imagine, Gin beach derives it’s name from the period of prohibition when Montauk was a beehive of bootleggers. “Every night a fleet of Nova Scotian, English or Cuban ships would drift 12 miles offshore, just beyond the US territorial waters, and they became known as the Rum Line. Each night a flotilla of small craft would sneak out of Montauk, dodging Coast Guard boats, to fill their holds with as much Canadian whisky and Jamaican rum as they could take. Those that made it home would unload at Gin Beach, Shagwong, or Oyster Pond.” A truck would pick up the booze. A favorite storage spot was the old Wyandannee Hotel, a safe haven for bootleggers. From there shipments went on to New York City. Gin Beach starts just east of the inlet to Lake Montauk. You get there by taking East Lake Dr. from Montauk highway (or just following the airport signs. There is a parking lot, bathrooms, showers, and food vendors in the summer. The beach is considered child and family friendly and a nice bathing beach alternative to the ocean beaches. 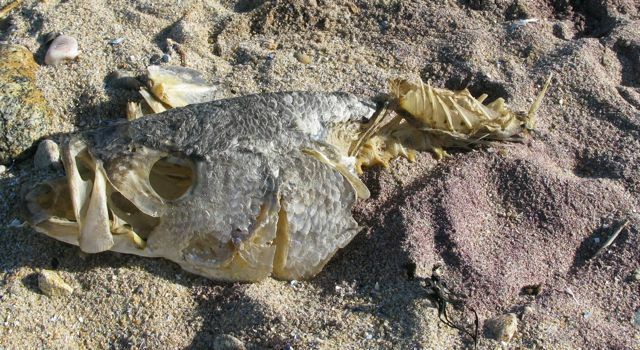 The beach faces north (Block Island Sound) and extends about 2 miles due east all the way to Shagwong point. On the way it’s worth while climbing on to the dunes, about 20 feet high. You will get a nice view of the runway of Montauk airport, the eastern end of which is just over the dunes. If you wait a while you will see a single engine piper fly right over your head to land on the runway. They skim the dunes by what feels like just 30 feet. 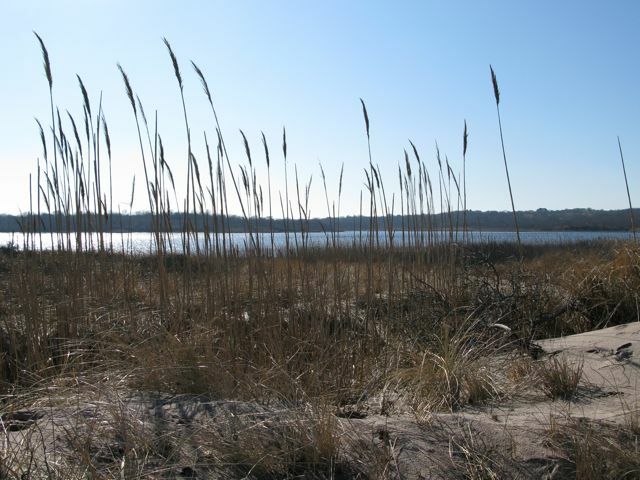 You can also catch a glimpse of Big Reed Pond and you will get nice views of the entire 2 mile beach. An aerial view of Shagwong point with both Big Reed and Oyster Ponds in the back ground can be found here. 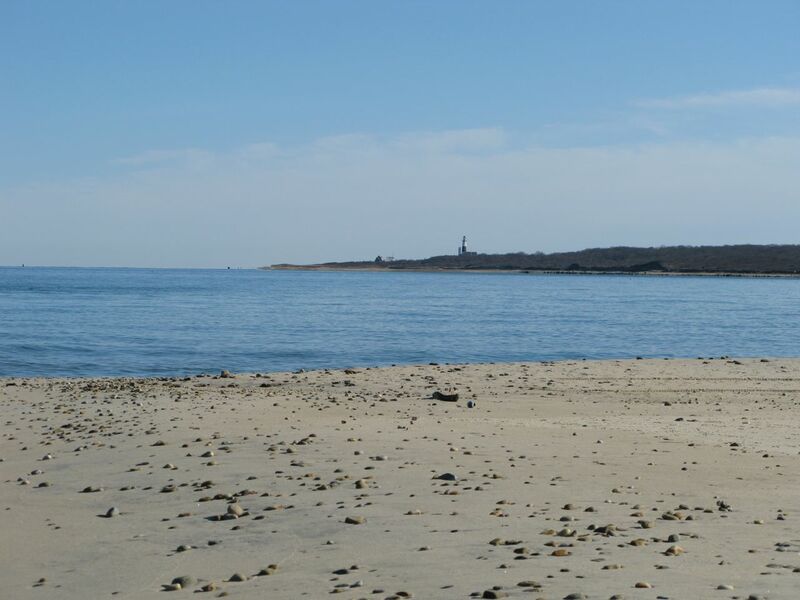 As you come around the bend of the coast line at Shagwong point you see the Montauk Lighthouse. This is a beautiful spot, normally only frequented by sea gulls. There are eddies and currents visible just off the point, so I imagine the fishing must be good. Montauk light house seen from Shagwong Point in the distance. Gin beach is mostly sand and some rocks. No shells really. 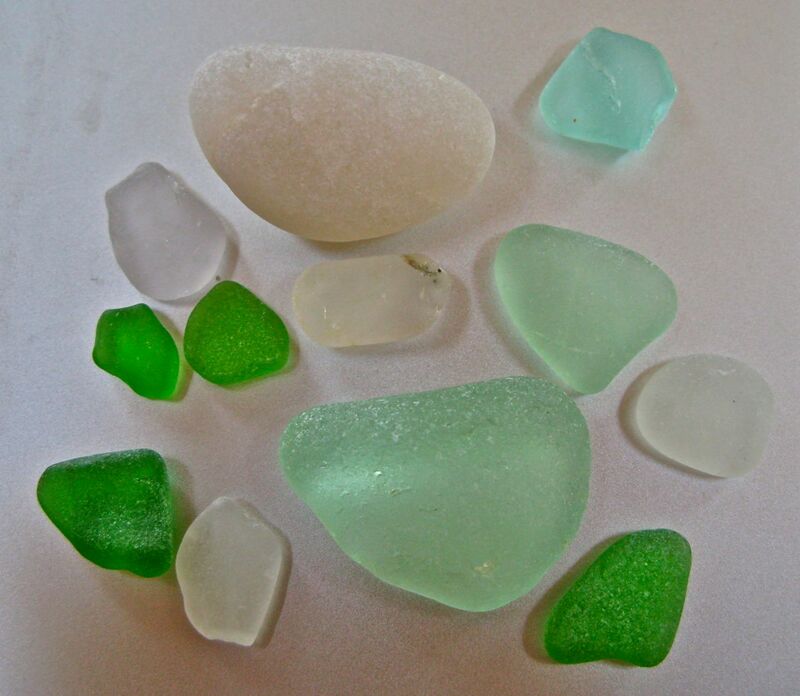 Some nice sea glass and drift wood. There are quite a few large logs lying on the beach. So when my dog ran ahead to sniff at what looked like a large motionless log on a sunny, but cold, January day, I wasn’t particularly worried. She sniffed and then the log moved! The dog backed away startled. What was a “log” was an entwined human couple! Yes, this beach is an ideal romantic get away. 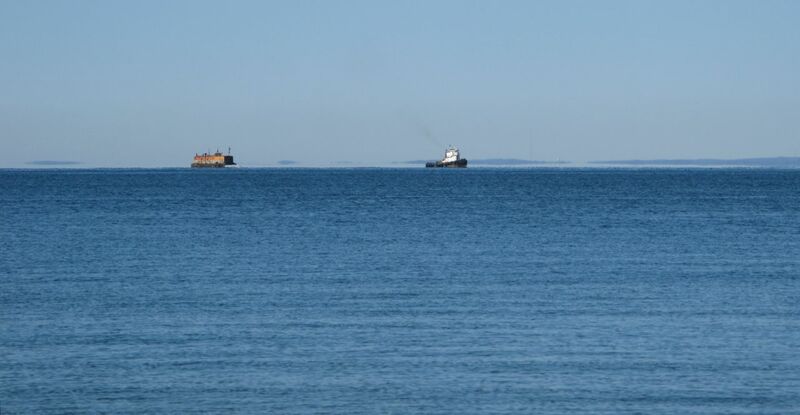 In the distance you can also make out large boats and barges from Connecticut harbors making their way through Block Island Sound in the direction of the Atlantic ocean. The stretch of beach from Shagwong point to the inlet of Oyster pond is difficult to reach. You can extend your walk along Gin beach around Shagwong point, but that is a long way. You can also reach the beach along a series of dirt roads that run north from Montauk highway towards the western shore of Oyster pond: Long Field Rd. to Cross Rd. to Borde Rd. You may have to leave your car along this route and continue by foot along a network of foot trails west of Oyster pond. On one occasion we parked the car at the parking lot off of East Lake Drive (just 1/4 mile before you get to Montauk Airport). It’s one entrance for hiking Theodore Roosevelt County Park, formely called Montauk County Park, beautiful nature preserve. From here you can hike around Big Reed Pond through a system of maintained trails and dirt roads. However, we found no access to the beach. At the very end there is an outlook just east of Shagwong point, but no way to get down (20 foot vertical drop off) and no way to get around due to very thick vegetation. There is a nice aerial view at this web site. Beach from Oyster Pond Inlet looking west to Shagwong Point. 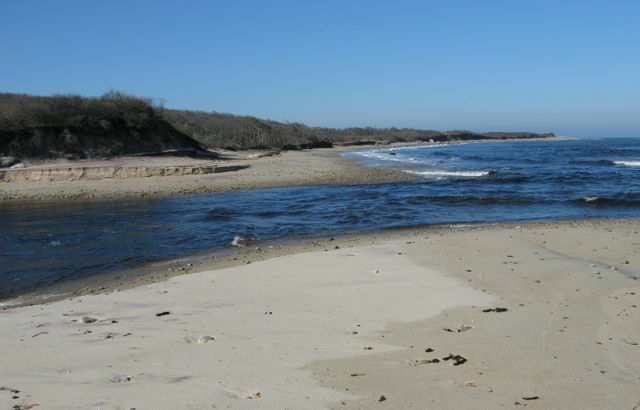 This remote beach can not be accessed from the east because of the inlet to Oyster pond which currently is at least 6 feet deep and often has strong currents. Just getting to this beach is an adventure. But once you are there it is a 1/2 mile of paradise! North road starts near the Montauk light house. It’s a sandy dirt road and you need a special permit for access. So its easiest to leave your car at the large parking lot by the light house. North road starts just west of the restaurant/visitors center on the north side of Montauk point. North road extends for about 2 miles winding through the dunes. You can take various tributary dirt roads that all eventually lead down to the beach. At first, when you are heading west, this is a rocky beach frequented mostly by surf casters. Fishing for blue fish and striped bass is excellent in this area due to the eddies and strong currents around Montauk point. The area has earned quite a reputation and is described as the “surfcasting capital of the world“. on the beach. 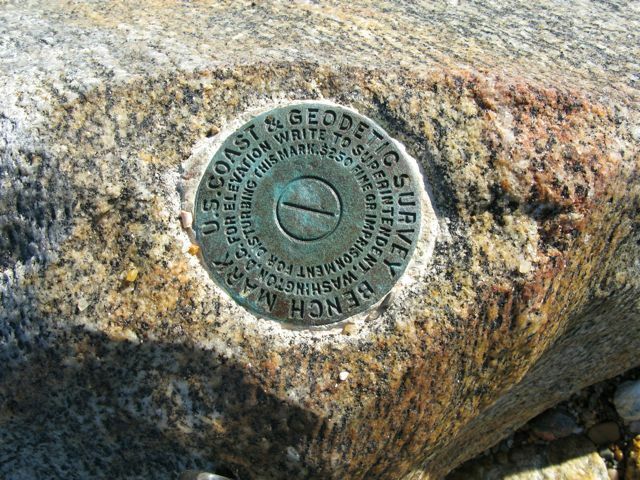 This markers may serve to mark the US Coast line. You can find out more about the National Geodetic Survey here. You can also look up the exact longitude and latitude of these markers. I went to NGS datasheet retrieval and typed in “Montauk Point”: there were 8 hits for geodetic markers! If you look at the data sheets themselves, they sometimes provide pictures of the survey marker. But I could not find the marker depicted here. You can also look for markers on an interactive map. As you can see, a “$250 fine or imprisonment” are the penalties for “disturbing this mark”. After approx. 1 mile you will reach the seal rocks. 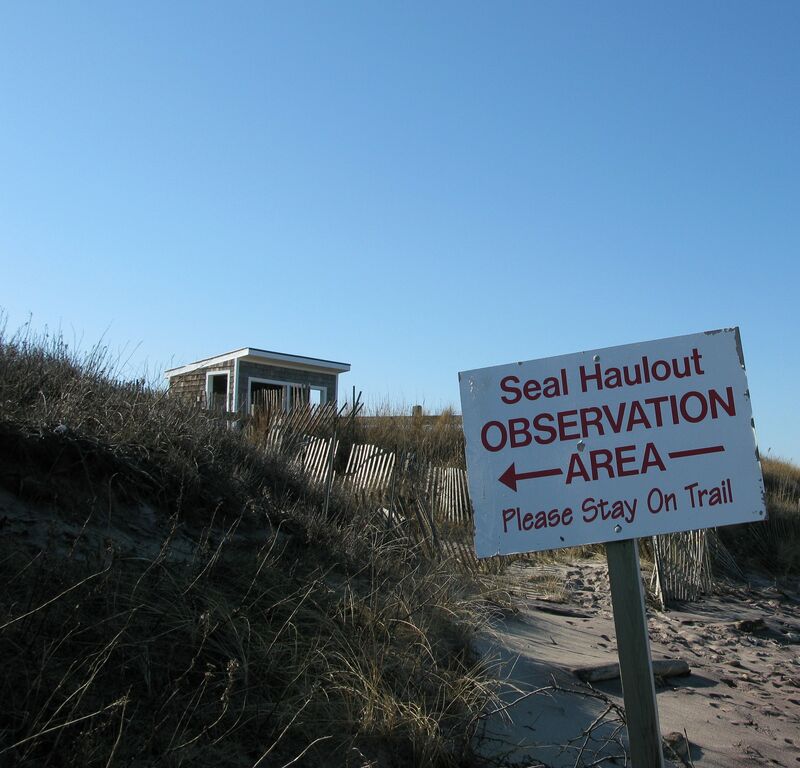 There is little cabin and a lookout on the dunes, with information on the seals that frequent this spot and other wildlife of the area. This can be a great experience for kids if seals are there. On my last visit in January 2012 there were no seals… Harbor seals, Harp seals and Grey seals are the most likely to visit the rocks which are just 20-50 feet off the beach. Beyond the seal haulout the beach extends westward with only a small dune separating the waters of Block Island sound from the inland waters of Oyster pond. I am told the pond used to be completely cut off from the ocean and most maps show no inlet. But, on our last visit in January 2012, there was a large inlet about 20 yards across and 6-8 feet deep with a strong current due to shifting tides, see picture above under “22 Oyster Pond”. The inlet is near the western end of Oyster pond. The beach itself is sandy, pristine and desolate, a truly beautiful spot. North road beaches are my favorites for collecting moon shells (naticidae) also called “shark eyes”. These are predatory sea snails that feed on other shells. Take a look at this video. They seem to like the north side of Montauk point. 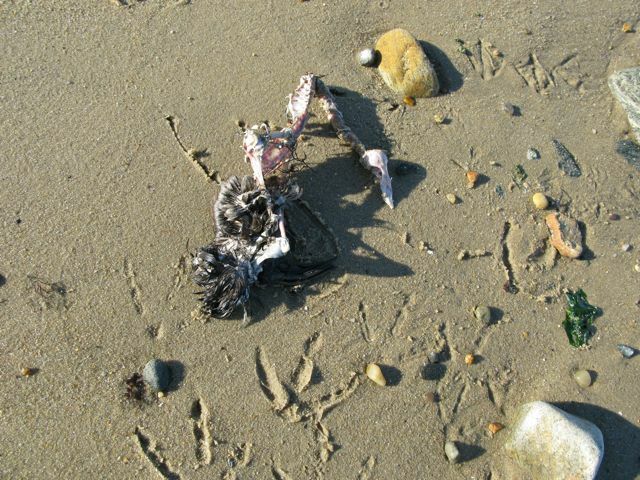 They wash up on the beach with certain high tides. So when you collect them, they are all in a neat row parallel to the water line. The shells smell badly for some time (it’s best not to bring them in to your home). 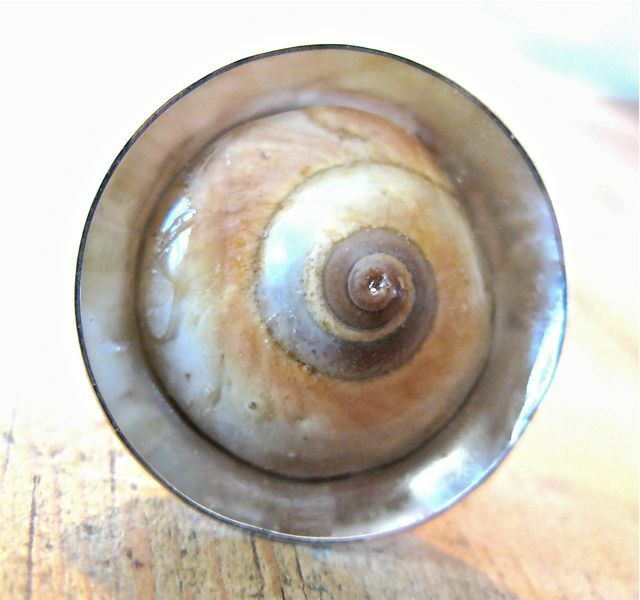 I like to immerse them in soap and water for days and then I cut off the tip of the spiral shell with a rotary diamond disc blade on a Dremel, and dry it out for several weeks. The next step is to fill out the back with 2-ton Epoxy (Devcon) and cover the front with same material too. I use tooth picks to do this! Finally, the piece can be mounted on Sterling silver to create a fun necklace pendent or a ring. This kind of moon shell beach jewelry is made just for summer beach lovers! Edward V Ecker was the father of the Eddie Ecker on the bumper sticker and he is very much alive !